Although I've posted a few of these in the main thread, I'm starting a new thread for the updated seed structures. Here is a new attempt at the seed lander. I really like the capsule. The ramp look slightly offset to the side of the doorway. Is there a reason for that? It's probably a trick of the eye due to shadows. I suppose I can make the doors flip up instead of outward. The robots need a ramp to get to the surface so I'd keep them as flipping down. That stated, I like this one but it's a bit bland? Very very grey. The original had more white, blue and purple in it. I don't know how important it is though considering that this is a hobbled together craft and it's only going to last 70 turns at most anyway. I meant flip the doors up (instead out outward), but leave the ramps in place. Here's another version, with extra dodads as requested. I see what you mean by trick of the shadows now. Once you mention it it's more obvious. I guess I was viewing the shadow of the door on the right as part of the opening. Definitely digging the additional details. It's like it has exactly the right amount. Wondering though -- if you look at the top ring, there's a stark contrast between it and the top and sides of the lander. But the way the render comes out there's almost not enough anti-aliasing on it? Wondering if it's a detail that can be expanded slighting to give it a more defined edge? It's a minor thing I think but just a thought. Anyway, adding this one to the game. Definitely loving it. Adjusted some colors and the top (slightly). And the updated seed building. That looks really cool. I like the base in particular. The brown band seems a little bland. It kind of feels like it lacks edges, or like it should be framed by something. I agree with Hooman about the base of the Seed structure, and about the brown band. The top just looks too much like the original. What about ringing the top, just above the brown band, with solar panels, instead of the group of eight. Then try bringing the roof up just a little and losing the dish and whip antennae? Just a suggestion. 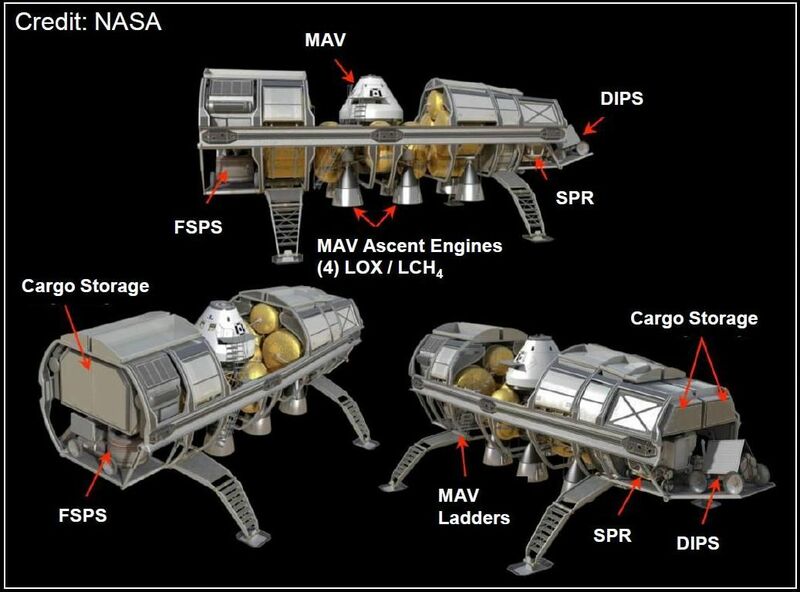 Here is the first draft of a cargo lander. Not exactly a "seed" structure, but it's in the same gameplay timeline. I tried to get away from the standard capsule style lander, though I found it hard without making some sort of scifi dropship looking thing. So I tried to pattern this after the NASA Mars EDL cargo lander concept. I'm not sure that I like how this came out. Much like the seed lander, I found it really difficult to put ship-sized details on there without making it just look like a mess. Hmm. It's different than I would have thought. But that's not a bad thing. Actually I like the idea of something a little different. I will say I always envisioned them being white like the tip thingy in the concept art. But I'll leave that up to you because that would mean they'd need to be painted and I seriously doubt they'd have the time for that. Definitely something unexpected and different. I like it. Took me a minute to figure out what you meant. Is this what you are talking about, a whiter version? I like the ramp and legs. The body I think looks a bit too cylindrical. I would expect something a little more aerodynamic for a landing craft. I also like more of a white color. Seems like it should be white for temperature insulation. As for painting, that should take little time or effort. The protections it provides, both against corrosion and thermal intake or emissions of radiation are likely to make it worth it. I can't imagine it not being painted. Okay. Here's a more classic capsule shape (albeit very large). This was intended to be the colonist lander, but I can modify it to also be a cargo lander. Leeor...I forgot that I already posted the above lander concept. I think it needs some rework, but from an abstract standpoint...what do you think of that sort of style for a colonist lander? Or should I get more creative similar to the cargo lander? I like the classic look. It would make sense from an engineering stand-point, much easier to build (already have the specs) etc. It could use a little tooling but it's a great replacement for now. I like it. That's a big step up. Lots more detail on this one. Love it. Adding it to the game. Looks nice, White Claw. Really nice. I must confess, I was beating my head a little trying to figure out how to spruce this one up just a little. Took a while before I eventually grabbed the top and just pulled. It ended up giving it just the right look for me to be able to add smaller dodads without it being cluttered.